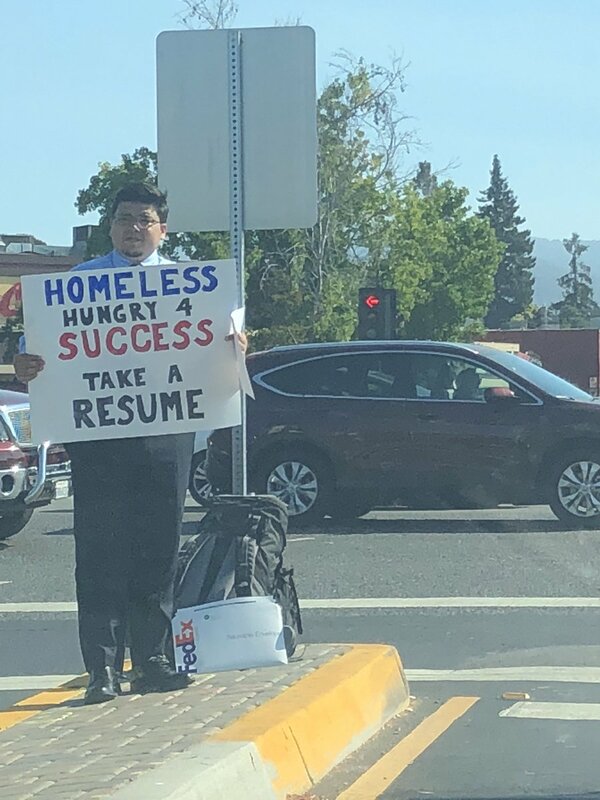 A homeless man who went viral after he was pictured handing out CVs at the side of the road has been flooded with more than 200 job offers. Passer-by and Twitter user Jasmine Scofield shared the images of the 26-year-old and his CV, in a post which was shared hundreds of thousands of times. David told the New York Post that he has since been contacted by hundreds of companies. “Google reached out to me,” he told the outlet. “So many other companies. Pandora. A bunch of start-ups. “A product manager from Bitcoin.com was wondering if I could work remotely or if I want to relocate to Tokyo. David said he quit a web developer job to move to Silicon Valley from Texas to make his own tech start-up, but ran out of money and was forced to live in his van. He lived there for more than a year until the Ford Transit was repossessed, and has slept in the park since. On Friday he said he dressed as best as he could, grabbed a stack of CVs and set himself up with his sign at the spot where Jasmine saw him. Can you solve these 10 Singapore primary maths questions?